Quadlock is a nifty little gadget that (I feel) every cyclist should have attached to their bike. Whether cycling around the busy city streets or undertaking a long distance ride, this smart looking accessory should definitely be on everyone's list. 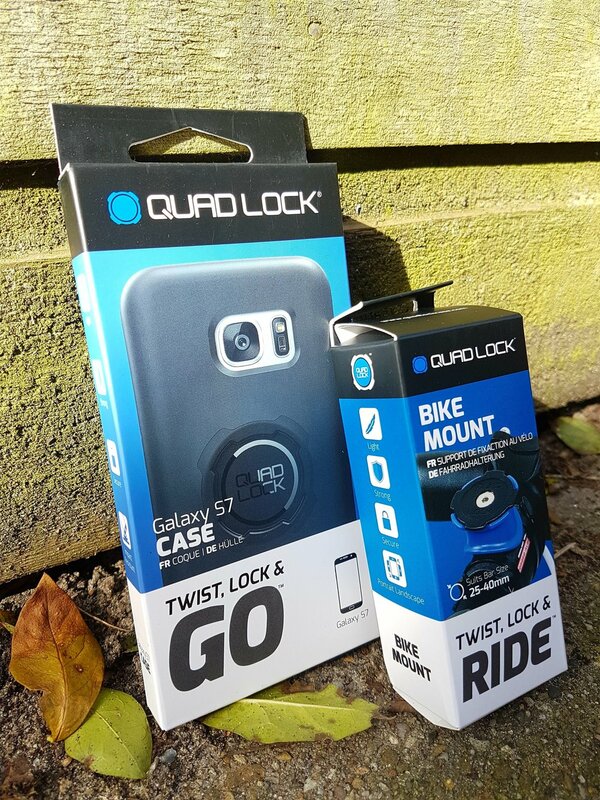 Quadlock describe their well designed phone mounts as "the lightest, strongest and most secure mounting system" available on the market. A bold statement to make, but having tested it out daily, on my cycle commute. I have to say they're pretty spot on with their evaluation. 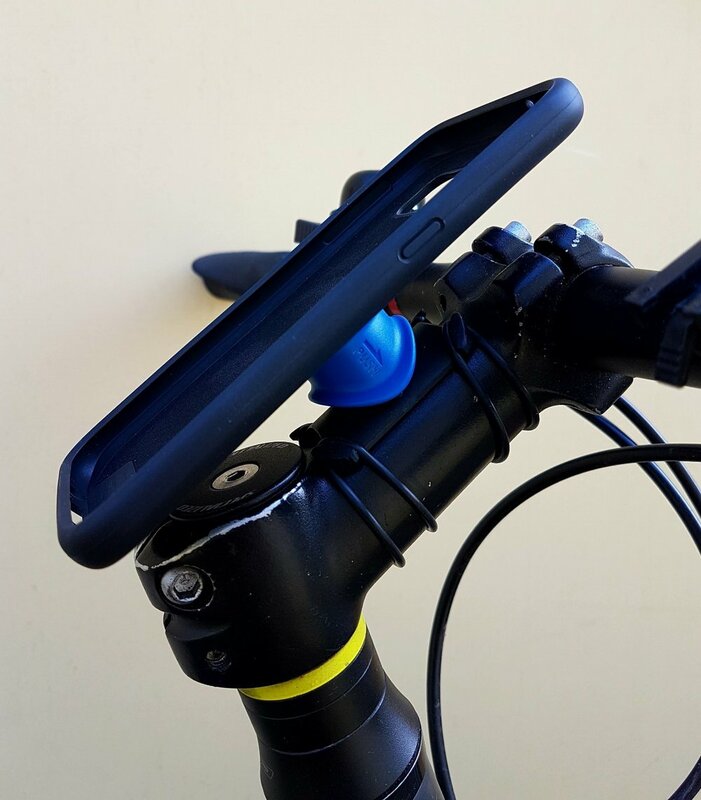 The impressive Quadlock bike kit is available for a wide variety of phone types and simply attaches to your bicycle stem seamlessly. With minimal amounts of complicated installation and fuss. I obtained a Quadlock system to fit my trusty Samsung S7 smartphone. The company make some many specific cases, for iPhones and Galaxy models and also sell a Universal kits that will mount pretty much anything. Well... within reason! The kit comes in two small and sturdy packages. These are well designed and are very easy to open. There are two parts to the kit: a mounting plate that you stick to your phone (rather like a phone cover) and also a bar mount that the phone eventually clicks into. The other part of the kit, the Bike Mount Pro, attaches firmly to your cycle stem. You can attach this firmly with the use of either with O-rings or zip ties, which are also included. The O-rings are made from strong rubber and come in two different sizes. I used them on my bike and they fitted tightly and the unit was held firmly in place. Inside the packet there are also two other zip ties. Which are like conventional zip ties, that can be obtained almost everywhere. These are really great, if you only have one bike you want to use it with. Using the zip ties will allow you to hold the unit permanently in place. To attach the Zip ties you need to simply apply them to the curved underside of the mount, which has a very handy rubber face to stop it slipping, once it is in place. After a few minutes I had my unit fixed and in place and I was off and good to go. The mount is well made, sturdy and I really think it looks good. With striking blue and black colouring. I personally found it simple enough to use, once it was in place. All you need to do is firstly attach the Quadlock case to the phone. This surrounds the back of the phone rather like any protective case found in the shops. Next, you will need to place the phone up to the mount at an angle of around 45°. Once this is in the right position all you need to do is press it on to the mount, rotate it round slightly and simply wait for it to click into place. Once it is securely in place, the phone can be removed by pushing down on the blue collar and twisting it back out again. This is simple to do and can be done very quickly indeed. You can also push down on the collar and then change the orientation of the screen from portrait view to landscape, depending on what suits you best. Personally, I kept my unit in portrait mode as it stayed flush with my bike line and obviously didn't get knocked unnecessarily. * Available as an additional extra. The Quadlock unit not only is very well designed, robust and functional, it has also really added to my overall riding experience. During this initial test and subsequent journey out on my bike, I attached it to my regular commuter bike. The bike I use daily, to travel back and forth from work. Through habit and the endless pursuit of trying to call myself an athlete. I tend to track each and everyone of my rides using the popular Strava app. For the most part, I have been doing this with the use of my very reliable Garmin wristwatch and then (once complete) uploading the data to my Strava account. The great thing about having a navigation facility on the bike. Is that you can not only track your ride and route, but also you can see the live data feed during all of your rides. Using the Strava app function on my phone, mounted in my Quadlock unit meant that I could ride and also see the relevant data on my phone, as it happened. Like me, if you are an avid cyclist. Then frequently looking at your live data is always very helpful. Furthermore, while enjoying a regular Sunday morning cycle out in the countryside of the Netherlands. I could also plug in my headphones and listen to my music or an audiobook. 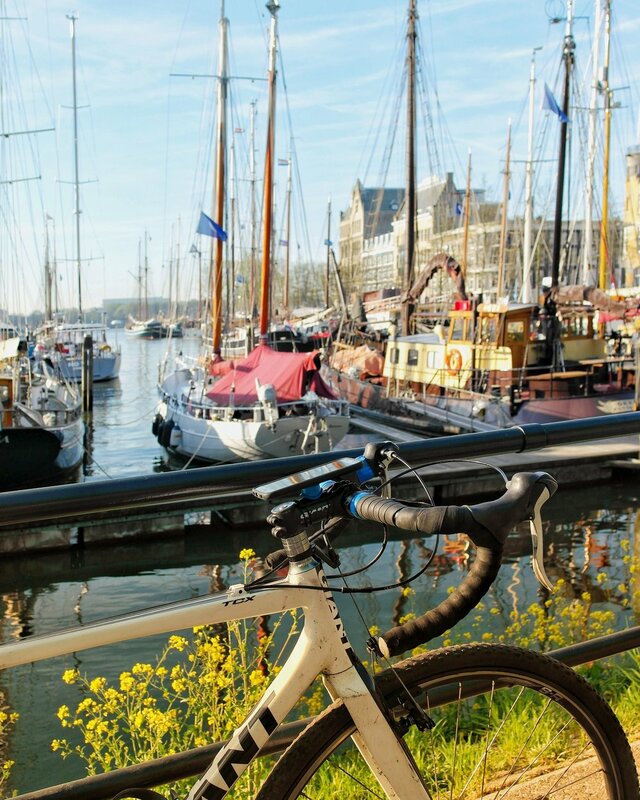 This is something I often enjoy, as the cycle routes here in the Netherlands never really get that busy. Plus you have the added bonus of not having to worry about cars next to you. So, simple pleasures can be still enjoyed and as a result of this, I can not only admire the beautiful scenery all around me but also have the chance to listen to music. Allowing the miles/kms to pass by with ease. If you look around or indeed shop around. I'm sure that there are many other cycling gadgets out there, that will compare and compete with what Quadlock has on offer. Having used the Quadlock every day on my commuter cycles to and from home to work, I have to say how wonderfully pleased I am with this amazing product. I have been suitably impressed with not only the overall build quality of this wonderful gadget, but also its ease of use. Once it had been fitted to the bike. I use it every single day and attaching it and taking it off is a breeze. It therefore is not only perfect for day to day use, but also ideal for longer touring rides, which I most certainly will use it on in the future. On a personal note, I'm never really that impressed with overpriced and over promoted gadgets. I much prefer to keep things simple and I'm perfectly happy if it does exactly what it says it does. This product does everything it says it will and therefore I would thoroughly recommend it. Each and every time to anyone wishing to have a cycle unit or add on, that is above all else superbly reliable and extremely easy to use. Quadlock has a very impressive range of products that can be viewed on their slick and informative website. 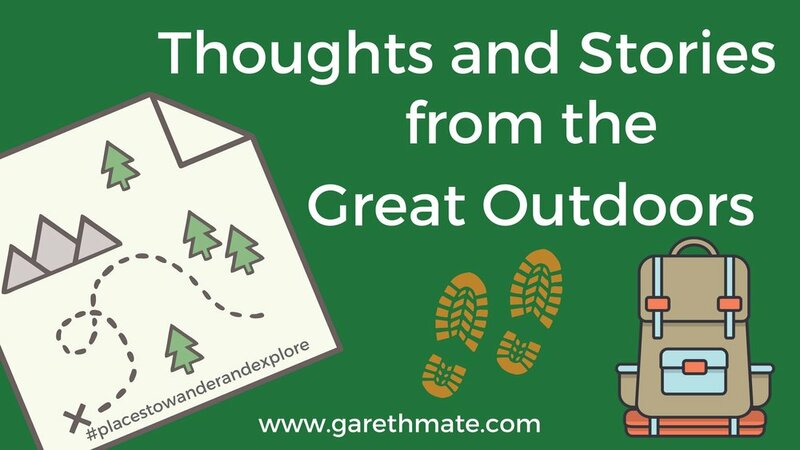 Providing practical information for anyone wishing to enhance their travel experience allowing them to wander and explore, a whole lot more. Click below to read more of my work.